Gibsons Landing captures the essence of the sunshine coast. 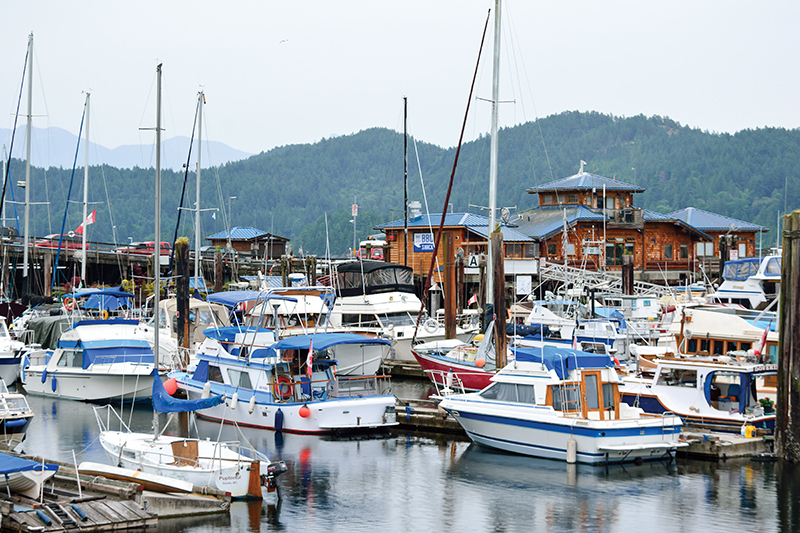 Twenty miles northwest of Vancouver, B.C., on the Sunshine Coast, the colorful seaside village of Gibsons attracts hundreds of boaters year-round. It makes an ideal weekend getaway spot for local city dwellers or a wonderful overnight stop for cruisers on their summer migration to points farther north. The latter was the situation for Arlene and me last summer. We were headed north and had plans to rendezvous with our friends Kevin and Wendy, who were on their way south. The plan was to get caught up since our last visit a few months earlier, take in some of sights and enjoy dinner at one of Gibsons’ many popular restaurants. The working harbor is the soul of the village. 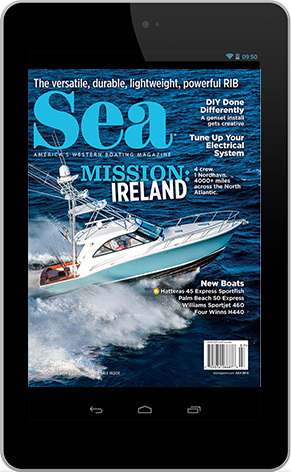 Visiting boaters have their choice of two marinas when visiting. Inside the breakwater, Gibsons Marina, VHF 66A, is to port and offers 20 guest slips on “A” dock. If the visitor’s dock is full, staff will direct you to vacated slips. 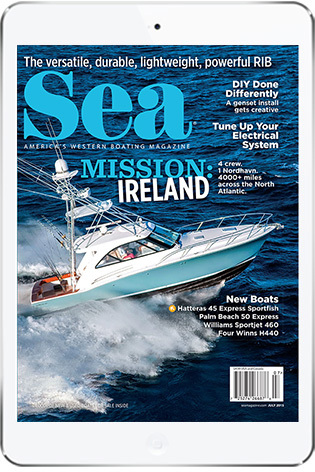 The marina offers 15- and 30-amp power, fuel, washrooms, showers, a chandlery, laundry and a pumpout. For our visit we had agreed to meet at the Gibsons Landing Harbour Authority, located to starboard once inside the breakwater. 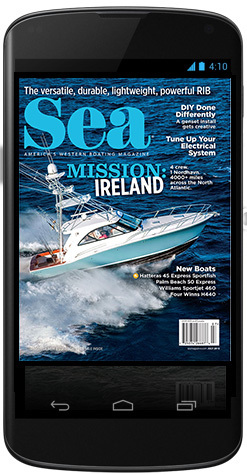 On the docks there is 30- and 50-amp power, a pumpout and Wi-Fi. 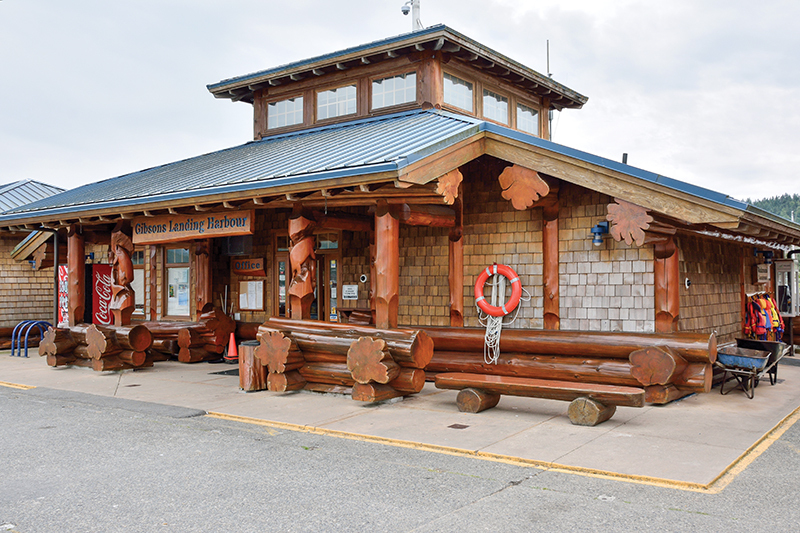 The harbor office, washrooms, showers and laundry are housed in the impressive cedar log building at the top of the ramp. A pedestrian pier and gazebo overlook the harbor. In 1859, George Gibson married Augusta and shortly after headed west from Ontario in search of land and a new life. He built a flat-bottomed sloop called Swamp Angel in Nanaimo and sailed to the Sunshine Coast, in 1886, where he laid claim to land that became known as Gibson’s Landing, and in 1947 became the town of Gibsons. Canadian residents are particularly familiar with this area because it was the site of a long-running Canadian television show, “The Beachcombers,” about life in a small waterfront town. From 1972 to 1991, CBC Television shot “The Beachcombers” series here, imprinting its weekly images of log booms and salvage boats on the collective Canadian cultural brainstem. Facing the sea and coastal mountains, homes are tiered into a slope that climbs from the shoreline. Thankfully, development has not overtaken the waterfront. Gibsons retains it salty-dog charm thanks to the relegation of chain restaurants and retailers to nearby Upper Gibsons. A tide of entrepreneurs, artists and retirees has washed ashore here, bringing their taste of music, art and culture, varied restaurants and espresso-based beverages. The result is an independent small town that supports a mix of bookstores and galleries, its own small theater house, and even fine-dining restaurants. To provision, you can find the basics at Fong’s Market 3 or the Village Store 4 . However, major provisioning requires a cab ride to Upper Gibson’s Super Valu or IGA. Gibsons has open-air markets during the summer. On Friday afternoon, you can purchase fresh local produce at the Farmer’s Market across from Gibsons Marina. The Gibsons Landing Sunday Market is held in Holland Park. There are excellent dining choices just steps from the boat. For a quick bite, try a tasty pulled pork sandwich from the Smoke on the Water BBQ Shack 5 at the top of the ramp next to the harbor office. Sweetwater Bistro 6 is the place for fabulous seafood served on the deck. Gramma’s Pub 7 is a fixture with locals and is not to be missed. Our plan for dinner was Smitty’s Oyster House 8 but we discovered it is closed on Monday. So we headed to the top of the government wharf to Molly’s Reach Restaurant 9 , the fictional site of “Nick’s Salvage,” the hangout for Nick, Relic and the gang of “The Beachcomber” television series. It came to life as a real restaurant in 1995. Painted daffodil yellow, the falsefronted landmark sits on the original homestead of the town’s namesake. 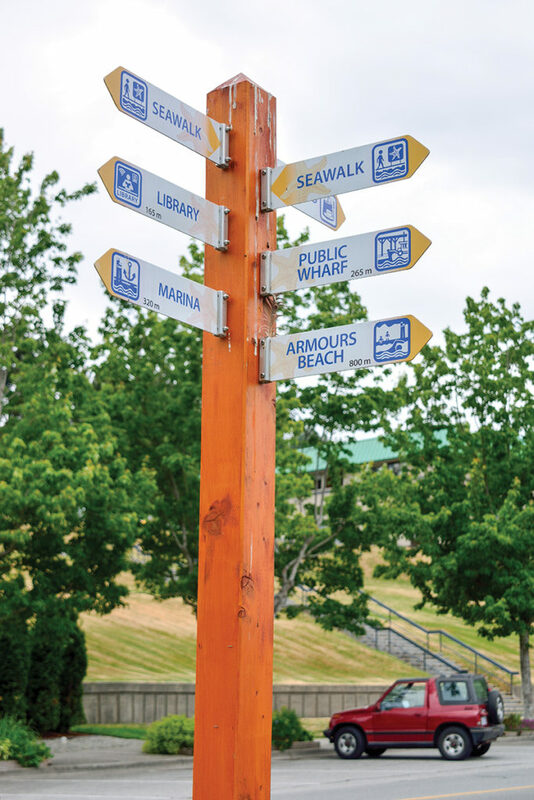 Weathered boathouses and fishermen’s cottages line a seawalk, an irresistible public path that traces the harbor’s west shore from Armours Beach to Gibsons Marina, linking sand and cobble beaches, connecting the two marinas and a waterfront park along its route. Sunshine Coast Museum and Archives 10 is where to find information and displays on Gibsons early logging, fishing and farming, and memorabilia from “The Beachcombers” TV series. In June, Winegarden Park overlooking the harbor is home for the Gibsons Landing Jazz Week, and from June to September enjoy the sounds of Music in the Landing. This is a nice concise article that captures slot of the beauty of the Gibsons Landing that I call home for that past 3 years. Smoke on the Water BBQ Shack is the newest of the restaurants mentioned and is open year round. A couple of new things to know and have you coming back soon Gibsons Landing is about to open a year round farmers market and west coast aquarium along the sea walk, a craft brewery and tasting room behind Fongs Market and The first waterfront hotel and Sparkling Hills inspired spa with a much needed marina is about to break ground! It’s a small town with a creative twist just 40minutes from Vancouver. We hope to see you again soon!